Debrecen (Hungarian pronunciation: [ˈdɛbrɛtsɛn] ( listen), kent bi alternative names) is the seicont lairgest ceety in Hungary efter Budapest. Debrecen is the regional centre o the Northren Great Plain region an the seat o Hajdú-Bihar coonty. 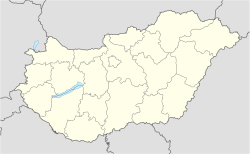 It wis the lairgest Hungarian ceety in the 18t century an sometimes describit as ane o the maist important cultural centres o the Hungarians. Debrecen wis an aa the caipital ceety o Hungary durin the revolution in 1848-1849 an bi the end o the Warld War II in 1944-1945. ↑ "Διεθνείς Σχέσεις". e-patras.gr. Retrieved 2012-12-25. ↑ "Syktyvkar :: Regions & Cities :: Russia-InfoCentre". Russia-ic.com. 2010-12-12. Retrieved 2012-12-25. This page wis last eeditit on 12 November 2018, at 22:32.